With the help of a rather furry monkey in a gold fez and red waistcoat, a genius squirrel with the propensity for coding and an addiction to roasted cashews, a fox in a velvet waistcoat and a tendency to use rather colourful language, and an emu for pure entertainment value and rides in the garden, the blog now has a new layout. Are there any further changes you would like to see? Does the page seem to work for you all? You have animals helping you with your blog? It feels more cold here now, but it is cleaner and lighter too. It reminds me of a hospital. I think it comes off more professional. The only opinion that really matters is yours and how you feel about it. It's definitely cleaner and more simple! I really enjoy the new look! It's very fresh & modern... a great representation of your site. Awww I love your animal friends, the emu sounds particularly fabulous. I lvoe the new layout!! LOVE IT love you-am reading LC's book now...expect a review. And then the blonde wig comes out...I am still laughing DK! Your animal posse sounds fun. loving the new layout - neat & streamlined, i like! Holy moly, it's FANTASTIC, DK! Animals r helping yuh ! New luk is gud as well. I never realised you weren't on my blogroll..I'm off to update mine! love d backgroud, white is always better for reading.. The blog is looking sharp! Personally it looks alot more professional but like it was mentioned before, it seems a tad impersonal. Like before it seemed really personally and warm to me. I like the new look! Great post! Wow! Love it, it looks great =) Very fresh & clean. Those are some awesome animals. I think that looks cool myself. I like it. Very clean and minimal. I'm not one for fancy backgrounds and such. my cat helps a lot w/ my blog. when are you putting up an outfit post bb? what cool animal friends tyou have darling! adoring the new layout. it is very cool and easy to navigate. an elegant header pic and a simple background pattern would do! I like it..but I miss your wonderful headers. 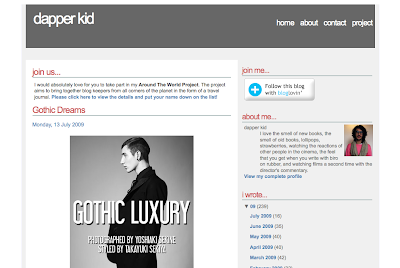 The blog looks amazing! Your animal amigos sound great as well! Hmmmm ....I hate to be negative, but I think I preferred the old theme! It just seemed to suit your post topics far better and made you feel like you were flicking through somebody's old journal! This seems more suited to a technology blog or maybe politics. Sorry to put a dampner on it!!!!! This layout is very..modern and clean. Very precise; it seems less welcoming. Your old layout seemed friendlier. I'm not sure how to explain it.HOwver, do what you will, its your blog!!! Your animals seem great....tell them they did a wonderful job here! Team Animal Dandies did a wonderful job. Well done to one and all of your furry friends. i like it. i wish i had such well dressed animals running my blog.